With winter officially in the rearview mirror, it’s time to tackle some much-needed spring cleaning around the house. One of the most important tasks that many choose to ignore is cleaning and organizing the refrigerator. 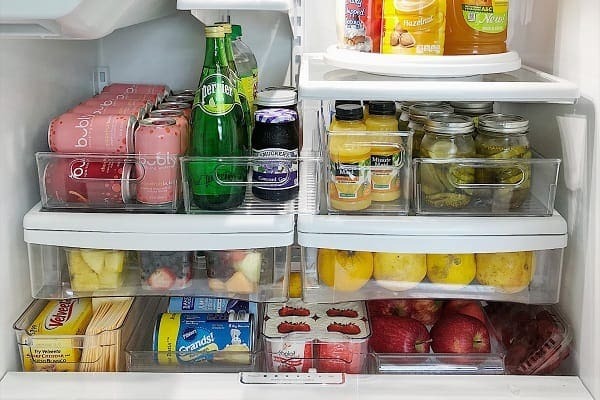 Don’t worry; we’ve got all of the best refrigerator organization tips to help you out no matter what configuration you own. Whether you have a side-by-side unit or a built-in French door refrigerator in your kitchen, you need to know how to maximize your storage space. 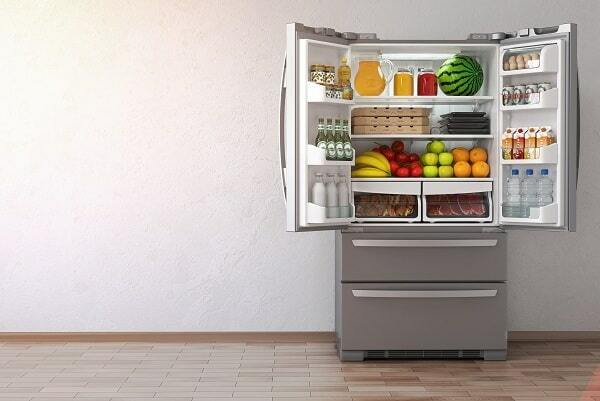 Here’s how to handle refrigerator management for every popular model. First thing’s first: Before you start organizing your refrigerator, you’ll need to give the inside a good cleaning. Start by removing all of the items from the refrigerator section, or you can choose to go one section at a time to prevent spoilage. Use non-toxic disinfectant wipes or spray to clean and wipe away any spills or stuck-on food. If your shelves are really dirty though, you may need to remove and soak them in hot, soapy water. Once you’ve cleaned all shelves, door bins, and compartments, try putting down removable plastic lining on each shelf to make your next cleaning even easier. This classic configuration is still very popular today, although not without it’s storage issues. These units offer plenty of height and vertical storage, but not much width in each compartment. Therefore, side by side refrigerator organization comes down to making the most out of the room you have available. Most refrigerators don’t fully-utilize their vertical storage capacity, so try adding some more shelves to maximize your space. Do some measuring, then head to a home store where you can find inexpensive wire shelves that will work like a charm. 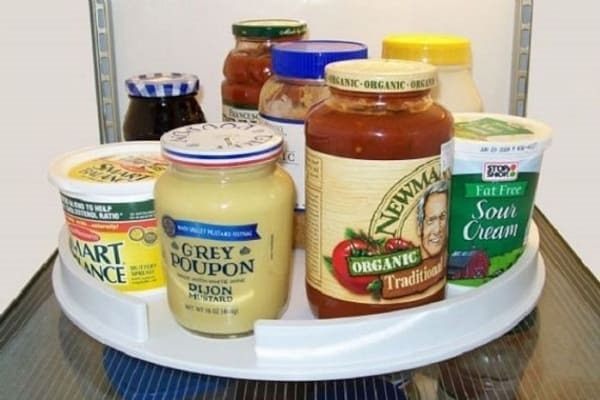 Since you don’t have much width to work with in a side by side fridge, a lazy Susan makes for the perfect addition. Throw anything on it from condiments to beverages to leftovers, and simply turn the tray for easy access to everything! It’s also important to know what areas to avoid keeping certain foods in. Perishable foods and liquids like milk should never be kept in the door where temperatures tend to fluctuate. Be sure to keep meats at the bottom of the unit too to avoid contaminating other foods. French door refrigerators are today’s most popular models. They provide not only more width in the fresh food section, but come with numerous storage options that can be taken advantage of. Most of these models come with adjustable shelf brackets that allow you to customize the height and location of your shelves. Make a plan and place your shelves accordingly. Also, if your unit has a dedicated fruit bin, vegetable bin, or deli tray, use them for what they were designed to do maximize the shelf life of your foods and prevent contamination. Another one of our handy French door refrigerator organization tips is to keep like items together using plastic bins. Clear plastic makes scanning your inventory easy, and labeling each bin ensures that everybody sticks to the plan. Some bins can even be stacked for additional storage! Just like with side by sides, it’s crucial to avoid storing perishables like milk or dairy products in the door. Instead, use this space for things like condiments, juices, or wine bottles. 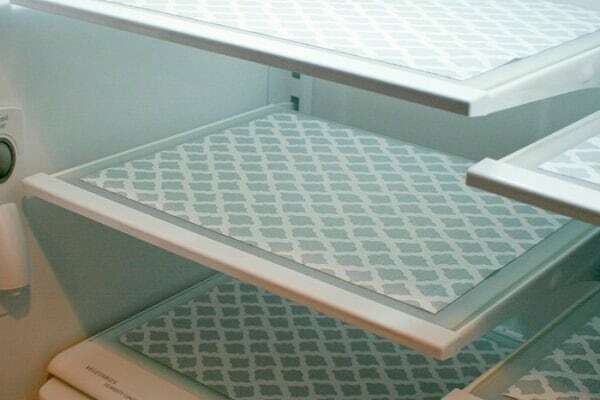 These simple refrigerator organizations tips should make your spring cleaning a breeze this year! If your fridge starts acting up though, be sure to call the refrigerator repair Santa Fe experts at Ortega’s Appliance Service right away. 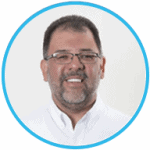 Manny Ortega learned the appliance repair industry from his father and founded Ortega's Appliance Service in 1993. He is a member of the United Servicers Association and is proud to serve the residents of Albuquerque, NM. Outside of work, Manny enjoys racing events with his family. Do Your Range Burners Spark All the Time? This Might Be Why.